Pretend your spending the day at the zoo with these 10 zoo animal crafts for kids. Elephants, crocodiles, lions, tigers, and more can be created to fill your fantasy menagerie or let you kids take on those personas. Your kids will love learning more about these different zoo animals while also having fun crafting. This craftivity is not only fun, it lets kids create a moving toy from start to finish. Draw zoo animals, then attach straws to the back. Thread yarn or string through the straws to make a climbing toy. It can be a fun party craft as the kids can then race their climbing critters to see which can get to the top first. Your little ones will love playing pretend zoo with these giraffe puppets. The puppet is easy to make from cardstock, and then the kids can put their imaginations to work as giraffes in the zoo or in the wild. Once you've made giraffes, let your kids decide what other animal puppets they can create in similar ways. This paper plate craft is tiger-tastic. It's orange, striped, and has cute tiger ears. Besides the tiger, there are also patterns to make paper plate and tissue paper elephants, seahorses, and monkeys. Your kiddos will roar over this lion mask craft. Even toddlers can make this all on their own with just a little bit of adult help. Paper chains are both easy and fun to make. Turn a simple paper chain craft into a slithering snake from the zoo. Craft these colorful elephants with sponges and paint. Hang these in your home to admire your kid's handiwork. 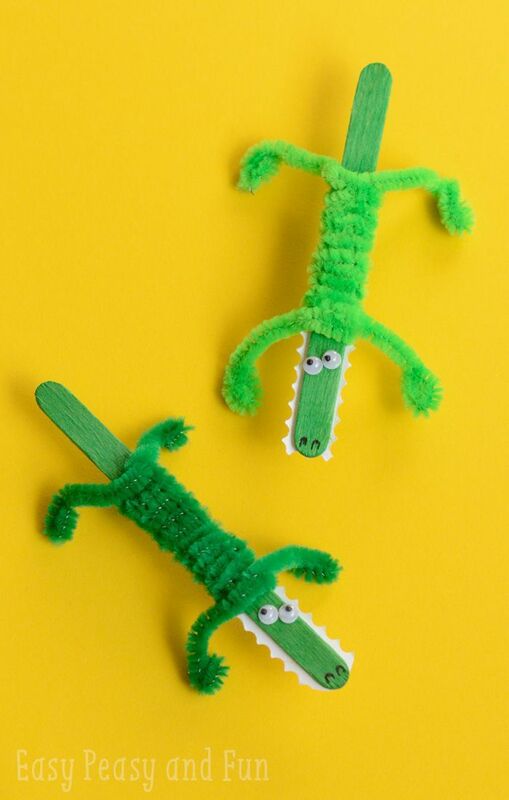 Craft sticks and googly eyes make crocodiles look super silly. Grab a few green pipe cleaners and you'll be ready to make this craft. Learn more about those exotic peacocks by doing this craft with your kids. Use multicolored feathers to decorate a plate into a peacock. Check out the butterfly exhibit with these cute coffee filter butterflies. Your kids will love decorating their very own fluttering friends with this tutorial. If you happen to have an unused stock of Hefty Zoo Pals paper plates (now discontinued), you can easily turn them in to a mask. If you missed out on them, you will need to be a little craftier to draw zoo animal faces on plates, perhaps gluing on ears from smaller plates.